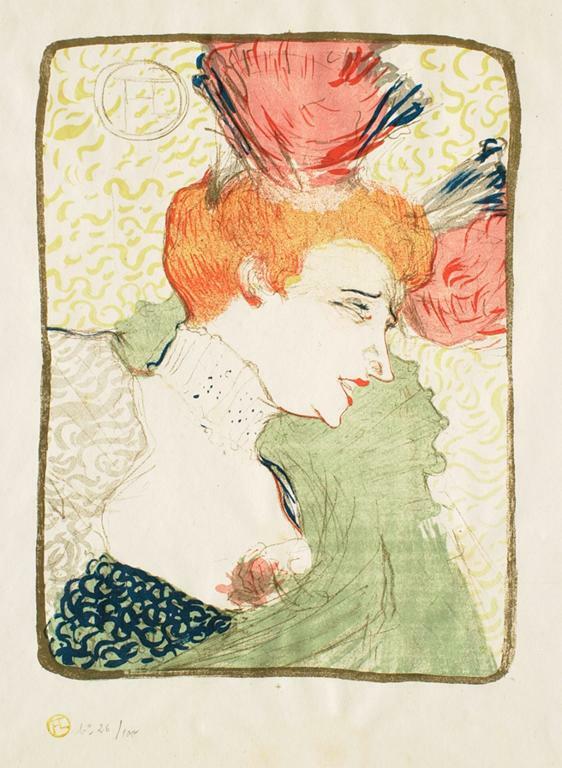 Henri de Toulouse-Lautrec, Mlle Marcelle Lender en Buste. Lithograph, 1895. Sterling and Francine Clark Art Institute, Williamstown, Mass. Baker, Christopher, et al. Collecting Prints and Drawings in Europe, c. 1500–1750. Aldershot, England and Burlington, VT: Ashgate, in association with the Bvrlington Magazine, 2003. An anthology of writings on the collection of prints and drawings in Europe, presented as papers held at the National Gallery, London, in 1997. The main focus is on the collections of gentlemen connoisseurs, critics, and amateurs, e.g. Ferdinand Columbus, Antonio Tronsarelli, Nicholas Lanier, Sir Peter Lely, and others. James, Carlo, et al. Old Master Prints and Drawings: A Guide to Preservation and Conservation. Edited and translated by Marjorie Cohn. Amsterdam: Amsterdam University Press, 1997. Considers the problems of the conservation and preservation of works of art on paper, looking at drawings and prints from the introduction of paper in Europe in about 1150 to the middle of the 19th century. Part I examines the character of works on art on paper, with chapters on collectors and mountings, paper, drawing and printing techniques and materials, and visual identification of graphic techniques and their supports. Part II deals with preservation: its history and modern practices, and technical problems such as temperature and humidity, light, pollution, and insects. Part III is on conservation: its history and modern concerns. Part IV is on specific conservation techniques: cleaning, stain removal, deacidification, consolidation and integration of paper, lining, and integration of color. Levis, Howard C. A Descriptive Bibliography of the Most Important Books in the English Language Relating to the Art and History of Engraving and the Collecting of Prints. London: Ellis, 1912. Intends to list and describe and most important, rare, and interesting books ("and some not so important") and show their development and the relationship between them. Includes chapters on "books of secrets and mysteries," dictionaries and histories on print-collecting, specific techniques (e.g. wood-engraving and lithography), private collections, French engravings, watermarks and print-collectors' marks, book illustration, dealers' catalogs, and others. Zigrosser, Carl, and Christa M. Gaehda. A Guide to the Collecting and Care of Original Prints. New York: Crown, 1972. Includes a brief introduction to prints and collecting, a short bibliography, a glossary of terms and techniques, one chapter on the artist and the print market and another on the dealer and the print market, and a paper on the care and conservation of prints. Hunter, Dard. Papermaking: The History and Technique of an Ancient Craft. New York: Dover Publications, 1978, c1947. Aims to give "bibliophiles and amateur booklovers an insight into the methods employed by the makers of paper in all parts of the world and from all periods; also….to interest and instruct papermakers, bookbinders, paper salesmen, and all users of paper." Includes chapters on the paper and papermakers of Europe and America during the early years of printing, watermarks, and papermaking materials and processes; also a chronology of papermaking and a lengthy bibiography. ———. Papermaking Through Eighteen Centuries. New York : W. E. Rudge, 1930. Deals only with early methods of papermaking; "aims to give…insight into the methods used by the old makers of paper, especially after the introduction of printing from movable types." Includes a chapter on the "eccentricities of the old [15th- and 16th-century] papermakers and the characteristics of the paper they fabricated," that contains such fascinating details as the cost of 15th-century papers, the weekly wage of a papermaker, and daily details of the papermaking trade. Notable for its detailed historical information on papermaking methods and equipment. Lunning, Elizabeth, and Roy Perkinson. Print Council of America Paper Sample Book: A Practical Guide. Print Council of America, 1996. Includes an explanatory pamphlet and sample book containing 26 paper samples that represent "the range of color, thickness, and texture one is likely to encounter among the prints and drawings of the last 600 years." Created to provide common terminology and a frame of reference to describe the characteristics of paper. Samples do not illustrate alterations that occur due to aging, environmental conditions, or exposure to light or acidic materials. Robison, Andrew. Paper in Prints. Washington, D.C.: National Gallery of Art, 1977. Exhibition catalog for a show at the National Gallery of Art in Washington, D.C., in 1977 on the aesthetic role of paper in prints, focusing on Western prints. Includes essays on paper surface (how surface creates or affects texture, receptivity to ink, and level of surface), color (prepared and dyed paper), size, and decorated margins. Catalog list does not include images. Briquet, Charles Moise. Les filigranes. Dictionnaire historique des marques du papier dès leur apparition vers 1282 jusqu'en 1600. Avec 39 figures dans le texte et 16,112 fac-similés de filigranes. New York: Hacker Art Books, 1966. A history of watermarks, arranged alphabetically by the descriptive titles of the marks. Includes a bibliography. Partially available online here. Print Study Room NC53 B75 1923 Repr. Lists of papermakers, arranged by country; plates reproduce 578 watermarks, corresponding to numbers given in the text. Print Study Room NC53 C48 Repr. Heawood, Edward. Watermarks, Mainly of the 17th and 18th Centuries. Hilversum, Holland: Paper Publications Society, 1969. Basic compilation of watermarks of the 17th and 18th centuries. Mosser, Daniel W., et al, eds. Puzzles in Paper: Concepts in Historical Watermarks. London: Oak Knoll Press, 2000. Essays from the International Conference on the History, Function, and Study of Watermarks held in Roanoke, Virginia. Not a general work on watermarks but a selection of essays on fairly specialized topics. Gerhard Piccard, ed. Die Wasserzeichenkartei Piccard im Hauptstaatsarchiv Stuttgart: Findbuch. Stuttgart: W. Kohlhammer, 1961. Standard body of watermarks. Each volume deals with watermarks of a different type; volume one is crowns, volume two is bibliographic references throughout. Publications, discussion groups, and other resources for books and paper on a sub-site of the American Institute for Conservation of Historic and Artistic Works' website. "This website is about paper, paper study, and paper history. It provides various resources in the following areas: historical research of paper in Europe, expertise for paper documents, measurement of structural characteristics of paper, support for the creation of new paper databases, introduction into digital paper studies." Includes a browsable watermark database and a collection of helpful links under the "Kit" heading. Icon has subsumed the Institute for Paper Conservation. This website is useful for finding publications, connecting to Chantry Library (which has a wonderfully quirky browsable catalog), and finding links to other paper conservation resources. Website created by the Dutch Institute for Art History, Florence. Online project to record, digitize, and study both watermarks and the structure of paper used for prints and drawings as well as artists' letters. Database contains approximately 2500 entries. Search by type of object depicted (birds, mammals, coats of arms, initials, etc. ), Briquet reference, Hollstein reference, place of origin, author/artist/painter, year of creation, and more. A list of paper museums and historical papermills, mostly European, but some Asian sites also listed. Educational website created by the Confederation of European Paper Industries. Covers many aspects of paper production, including paper history, the paper cycle, paper and the environment, and paper grades and products. "Paper history" section contributed by the Swiss Paper Museum and Museum for Writing and Printing. Site includes links to paper museums, paper associations, paper research institutes, and other commercial and non-commercial organizations. Website created by the Center for Applied Technology in the Humanities, Virginia Polytechnical Institute and State University. Online electronic database of the Thomas L. Gravell Watermark Collection of photographic reproductions of over 7,000 watermarks in paper, made between 1400 and 1835. Searchable on watermark characteristics (e.g. watermark name/number, mill, dimensions, chainline spacing, etc.) and administrative characteristics. Database can also be browsed by various categories, e.g. date of use, author, location. Thumbnails of watermarks can be clicked for larger images. Click "Supplementary Materials" for links to a lengthy bibliography, other watermark databases and sites, and other information.